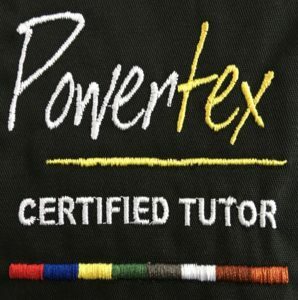 Not long ago I became a certified tutor of Powertex. Powertex is a water based, non toxic, environmentally friendly fabric medium. 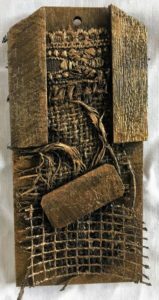 This extraordinary medium hardens natural fabrics, once the items created with Powertex have dried and ‘cured’ for 3 weeks they are water resistant and can be placed outdoors! Whislt I was at university studying art and design – I chose the textile route, of course – I wanted to create a free standing piece of knitting to represent derelict buildings, sadly Powertex wasn’t around then, so I had to use plaster of paris which obviously cannot be left outside or allowed to get damp let alone be able to stand in the rain, needless to say that piece did not last long – perhaps I should recreate it……hmmm. On the course I produced 4 pieces, starting from a very simple tag to a fanastic fantasy angel. An empty wine bottle with added ‘bling’! The fairies are very welcome to move into my little house. And lastly my fariy. She reminds me very much of the Doctor Who’s ‘Weeping Angels’, what do you think?